Both Western (Walter, 1980) and Russian (Isakov and Panfilov, 1984) biogeographers define a biome as a major climatically controlled biotic community. Vegetation is the most indicative characteristic of biomes. It is in a plant community that continuous energy flow and cycling of nutrients occur. Vegetation also provides habitats for heterotrophic organisms, such as animals, bacteria, and fungi. 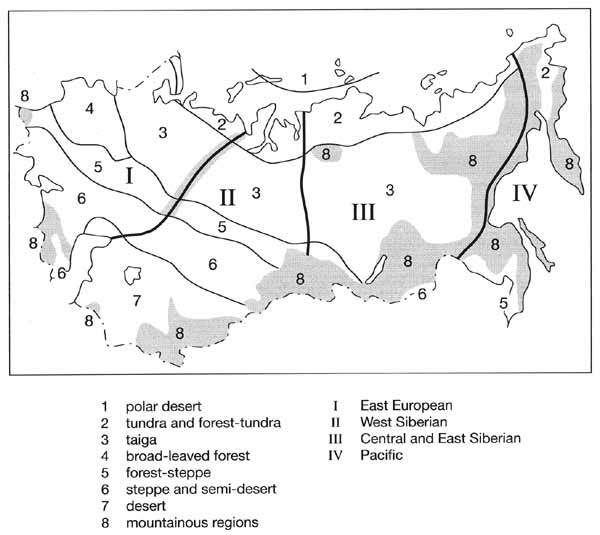 Nine major biomes and ecotones can be distinguished in Northern Eurasia (Figure 7.2): polar deserts, tundra (including arctic, typical, and southern tundra), forest-tundra, taiga (or boreal coniferous forest, including northern, middle, and southern taiga), broad-leaved forest (including mixed broad-leaved coniferous forest), forest-steppe (including broad-leaved forest and meadow steppe), steppe (including true and dry steppe), semi-desert, and desert. Mountains differ climatically from the surrounding plains and are considered separately as orobiomes (Walter, 1980). In comparison with 60 units of Sochava's (1964) classification of vegetation, this is a generalized scheme which is intimately linked to thermal and moisture characteristics of the territory (Figures 7.3 and 7.4). Apart from the biomes, four major biotic sectors are distinguished, East European, West Siberian, Central and East Siberian, and Pacific. The development of a biome depends on characteristics of the physical environment, especially climate. A comparison of the patterns of biome distribution (Figure 7.2) with the patterns of net solar radiation (Figure 7.3) and the rate of evaporation (Figure 7.4), reveals a close match between biome distribution on the one hand and heat and moisture availability on the other. 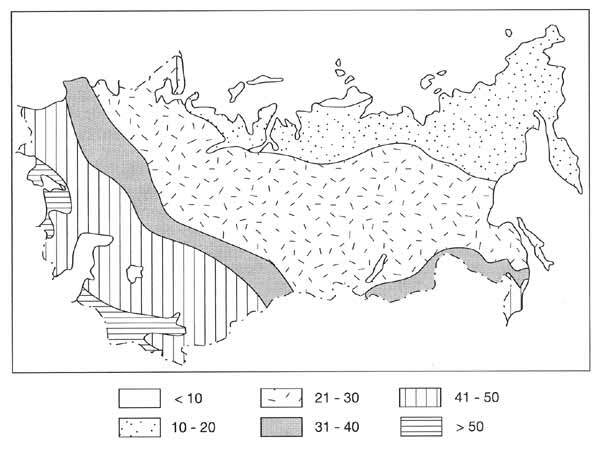 Strong dependence of biome distribution on climatic factors in Northern Eurasia may be demonstrated by introducing a concept 'climatic areas', suggested by Grebenschikov (1974) originally in relation to the vegetation of the Caucasus and later used in climatic ordination of vegetation of the FSU (Bazilevich et al., 1986). [Grebenschikov (1974) used the approach of Walter (1955) who introduced ecological climate diagrams into biogeographical analysis. The Climate Diagram World Atlas (Walter and Leith, 1967) contains over 8000 climate diagrams for various locations in the world]. This approach uses two climatic factors: the annual sum of air temperatures for the days when it exceeds 10°C and the annual amount of precipitation. By combining these two factors, heat supply to plants and the effectiveness of precipitation are evaluated. This approach, therefore, provides more relevant information from the ecological standpoint than analysis of annual temperatures (which encompass an entire variety of monthly averages and extreme values) or precipitation (whose effectiveness depends on evaporation). 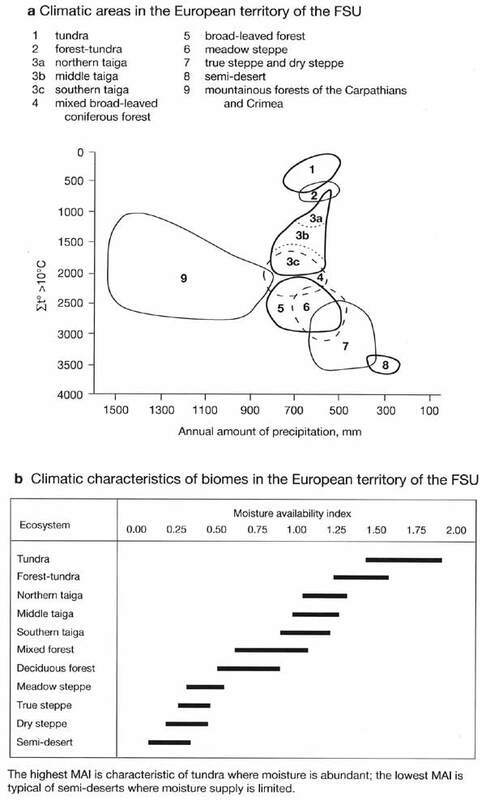 Figure 7.5a provides an example of the major climatic areas and illustrates climatic conditions which are optimal for the development of major biomes. Thus climatic conditions, favouring the development of forest ecosystems on plains are characterized by: (1) the annual sums of air temperatures exceeding 10°C ranging between 1500°C and 3000°C; and (2) the annual precipitation totals ranging between 600 mm and 900 mm. The tundra biome receives less precipitation and a much more limited amount of heat. Thermal resources of the arid biomes of the East European steppes and semi-deserts are high, while the amount of precipitation is limited. The areas of mountainous ecosystems in Eastern Europe (the Carpathians, Caucasus, and Urals) receive a high amount of moisture and a relatively low supply of heat. where P is the annual amount of precipitation (mm), E is potential evaporation (mm), and t are temperatures exceeding 10°C. Figure 7.5b shows the distribution of the same biomes as in Figure 7.5 a with respect to MAI. Note that although tundra receives average amount of precipitation, it is characterized by the highest moisture availability due to the very low evaporation rates. This is one of the factors controlling the widespread development of wetlands in the tundra biome. 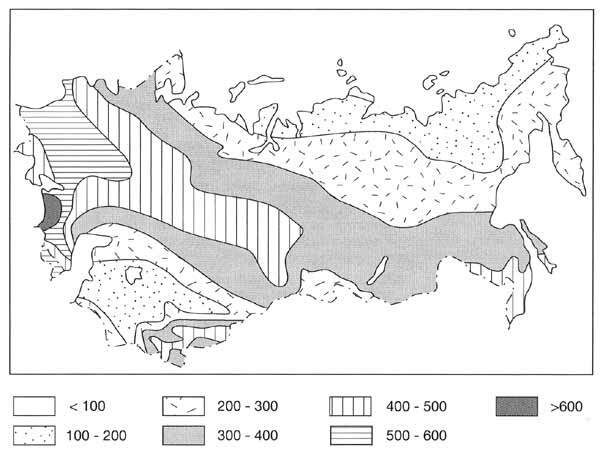 In the European territory, biomes generally follow a zonal (latitudinal) pattern (Figure 7.2). In Siberia, where continentality of climate is a major control, and in the Pacific sector, which is influenced by the ocean, the latitudinal distribution of ecosystems is less well pronounced. Not only are the extent and nature of biomes of Northern Eurasia determined by climate, but the location of biomes and of correlated climatic indices result from the interaction in which vegetation and climate affect each other. For example, the current northern and southern boundaries of the boreal forest approximately correspond to the location of the July 13°C and 18°C isotherms. Modelling has shown that if in the future extensive deforestation occurs due to, for example, over-logging, it can cause a cooling of climate sufficient to prevent forest regrowth in much of the deforested area (Bonan et al., 1992). Thus, boreal deforestation may initiate a long-term irreversible feedback in which the forest does not recover and the tree line moves progressively south.